With such a large international European City …. what are the top 10 things to do in Dublin? First tip …. Don’t try driving a car. I asked ten Irish natives (who live in Ireland) to name the top three “must see” sites in Ireland. All ten mentioned Dublin. Seven of the ten said Dublin first. Then I asked twenty-two non-Irish (Americans and Canadians) who had visited Ireland to name their top three, and Dublin didn’t even rank in the top five of their combined responses. The top five of the non-Irish surveyed? The Burren (#1), Connemara (#2), Galway (#3), Kilarney (#4) and the Ring of Kerry (#5). Sites in Wicklow, Donegal, and Cork were heavily mentioned by this group, but the West always claims the North American favor when I take a poll. I was listening to Rick Steve’s Ireland travel podcasts a while ago and he interviewed three Irish tour guides (including Steven McPhillamy whom I LOVE). Rick asked the same question, only he limited it to one place. What is the one place you’d recommend that everyone should visit when they come to Ireland? All three said … you guessed it … Dublin. Don’t get me wrong. I’m not a Dublin-hater. Dublin is a fabulous city, a walkable city with so much to see. The history and shopping and public spaces – as well as the sites within a short driving distance like the Boyne Valley and the Wicklow mountains make Dublin a worthy destination. <– Just PLEASE don’t try to drive in the City Centre (another post for another day). But if I had to choose only three sites in this enchanting country- Dublin wouldn’t make the cut. I find it interesting that the Irish see it differently. Perhaps it’s because they’ve grown accustomed to their own mystical landscape. What stuns the outsider – the misty fields and hills, the rural hospitality, the ruins and megaliths, and the slow-paced traditional way of life – is too close to the Irish. Maybe they think visitors want to see Dublin because it is something different and set apart. it’s where everything is… the center.. the hub…the nightlife … the heartbeat. That’s understandable. So here’s to the Irish and their magnificent capital city. I love Dublin too and I give you my TOP TEN list. 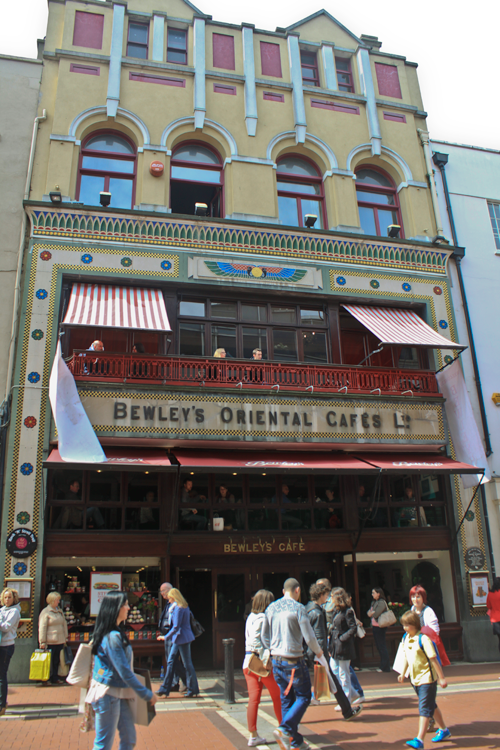 Enjoy a cuppa at Bewleys Cafe, but sit on the balcony and people watch. 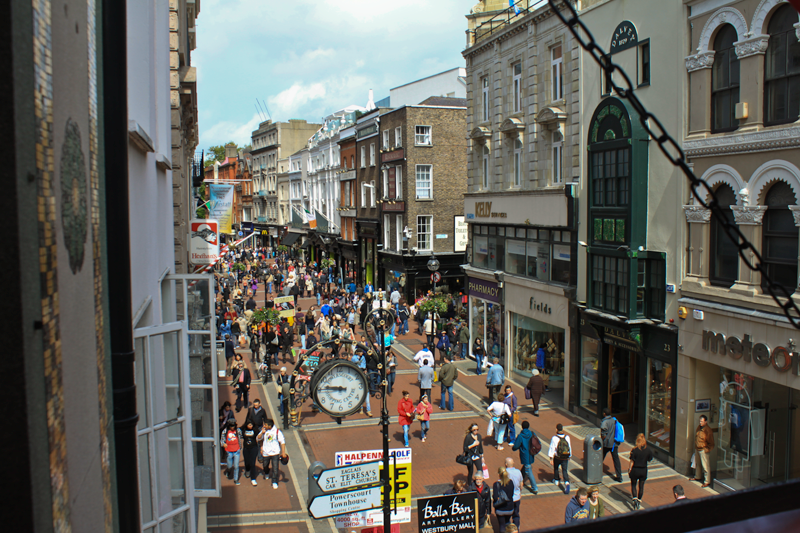 The shoppers, the buskers, the dog walkers on Grafton Street are interesting eye candy. Spend at least an hour in St. Stephen’s Green. See the west side, the waterfall, the playground, maybe a lunchtime concert. 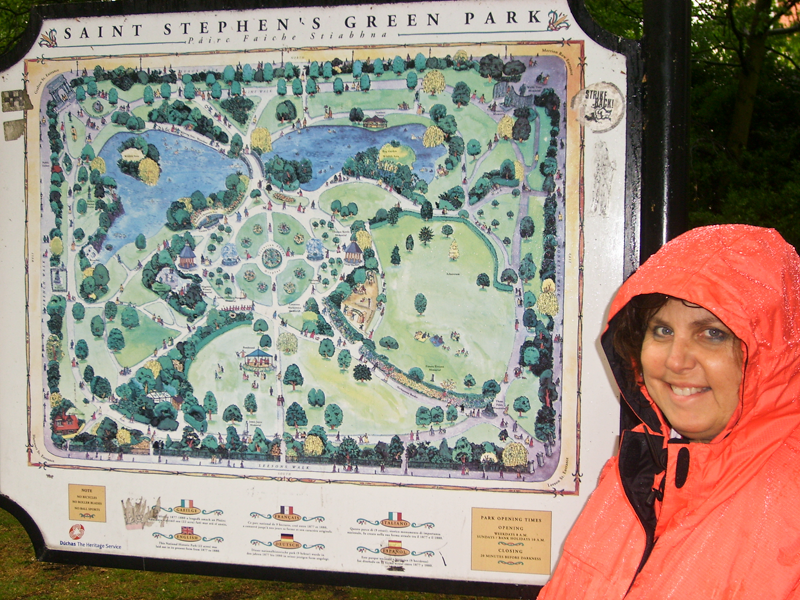 I love this park in the rain. Visit Sweny’s on Lincoln St. It’s a renovated 1847 drugstore. James Joyce visited there as did Leopold Bloom (to buy his soap) in Joyce’s novel, Ulysses. Now it’s a used book / antique shop. Stop in when the local reading group is scheduled to read aloud from Ulysses. See the Book of Kells. No matter what anyone says, this is WORTH SEEING at least once. Then take a walk around Trinity College. Shop on Grafton Street. Take time to listen to (and tip) the buskers. Visit the General Post Office. Go inside and go through the museum there. Take note of the damage to building from the Easter Uprising. Carefully view the details of the statue of Cuchulain in the window and read the declaration of Pádraig Pearse beside it. Visit the National Museum (don’t miss the Bog Man) and the National Gallery (Portrait collection is my fav – has Seamus Heaney and Maeve Binchy). Go to an Irish House Party – I almost never recommend things that are kitschy and touristy, but this is a great event for visitors. It’s a fun way to enjoy an meal, listen to Irish music, and get treated with hospitality. I’m a big fan. Walk. You can really feel the pulse of the City and make memories when you walk through Dublin. Look for a surprise, a discovery. Look for the unexpected. A place you didn’t expect to see. Ar person you didn’t expect to meet. Pick a part of town and enjoy the public art, public spaces, architecture, shops and most of all – the people. BONUS TIP – Meet someone “under the clock at Cleary’s.” Meeting there is an old tradition. Cleary’s is a large department store that was once a place where people met as a starting point for clandestine rendezvous. I appreciate your insights and advice, Mindie. I am just now planning my third trip to Ireland, and my first visit to Dublin. This is the way I have covered the UK and Ireland … visit the countryside first and get a feel for the culture and hospitality and character of the region. It’s those leisurely morning chats with a lovely B&B host over a nice fry-up that connects the dots for me – and that just doesn’t happen in the city. That said, I am looking forward to my two days in Dublin – and, after reading your post, I’ve allotted enough time during my meager 2 weeks in Ireland. I may give the Book of Kells a miss – only because I despise lineups and I’ll be travelling in July! I have also learned not to cram in too much sightseeing, lest I don’t see the forest for the trees. So glad you’ve had good experiences in Ireland. I’m about to write a second post of “don’t miss” sights in Dublin. Two of the additions will be The Garden of Remembrance and the Famine Memorial on the Quay. Don’t miss these. 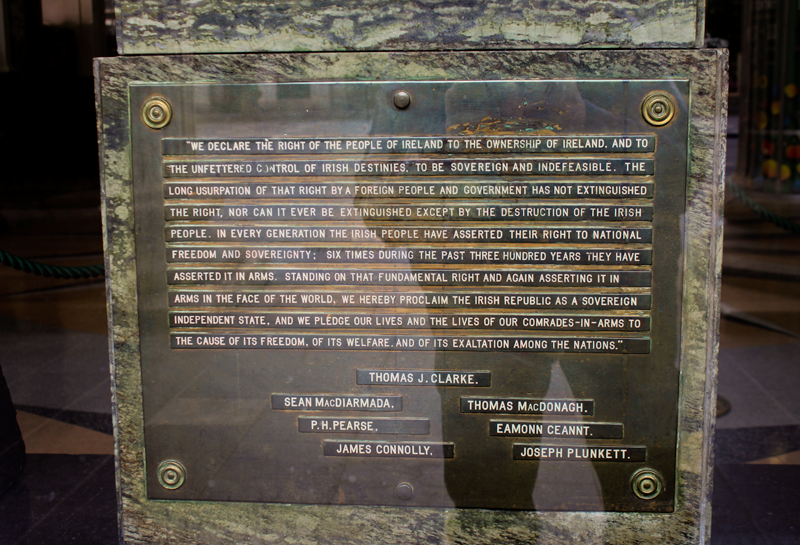 They’re in walking distance of each other on Upper O’Connell (Garden of Remembrance) and then the Quay. Gorgeous stuff. Have fun and let us know how it turns out. Next time you’re in Dublin. Visit the Botanic Gardens in Glasnevin. It’s a beautiful place especially in Summer. Around the corner is Glasnevin Cemetery. 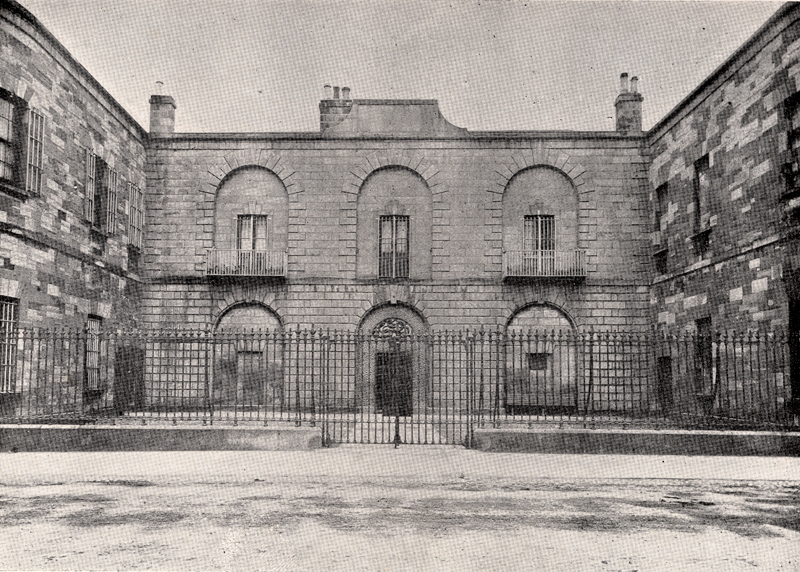 Besides being the “Dead Centre” of Dublin it is also the place where the great, good and not so good are buried. Irish President Eamon de Valera (1882-1975) who was one of the leaders of the 1916 rising is interred there as is Michael Collins who was shot in an ambush in Béal na Bláth Co. Cork on Aug 22 1922. Daniel O’Connell who has a street named after him in most Irish towns has a round tower built in his memory too. This you could use as a placemark if you get lost trying to find the cemetery. 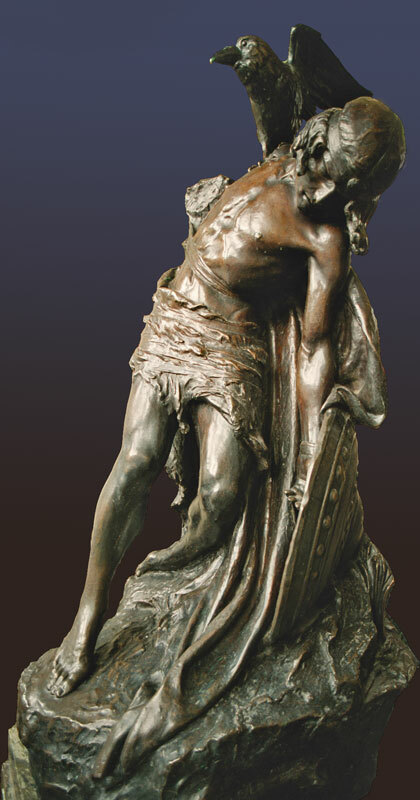 There is a brand new visitor centre in Glasnevin Cemetery and you can find it at http://www.glasnevintrust.ie They even do themed tours that are really informative ! After the tour you can go and have a pint of Guinness in one of Dublin’s oldest pubs “The Gravediggers” which is accessed through the back gate of the cemetery. No phones, no television. lots of great conversation though which is oiled by the fantastic and creamy pints of Arthur’s best Stout. Another off beaten track trip is a walk along the South Wall of the river Liffey. You can see the Two red and white chimneys which mark the entrance to Dublin Port and once supplied a lot of electricity to the capital. They are now disused and a furore ensued recently after a proposal was put forward that they should be demolished. These are iconic structures and will be left alone. You can get a bus or taxi that will leave you at the power station and you can then walk the couple of miles down to the very end of this boundary wall. On a sunny day there is a breathtaking view of the whole of Dublin from here. You will see the ships entering this busy port and at the end of the wall these look huge as they motor past you. Different and entertaining tours of the city that will be something to talk about over your dinner. Eoin, what great insights. One can tell you’re in the travel promotion industry. I so love Glasnevin and it’s true it should be added to my list. But your insights into the South Wall are fabulous. I’m going to do that next time I’m in Dublin. Sounds wonderful. I’d agree with you Mindie. Dublin is a place to stop for a day or two, to get over the jet lag, and a leisurely look around there will cover most of your top 10 in that time. After that, get out into the rural Ireland, and sloooow down. (Killarney / Ring of Kerry does not in my view count as rural. A wee bit too ‘Disneyfied’ these days). Get to the Thin Places, and slow down to soak up the stillness, and feel thousands of years of history. Get off the beaten track, sit in a rural cafe or bar and people watch. Go to a local church, wander in the graveyard and look at hundreds of years of history on the headstones. Try and pronounce the names. Observe. Be still. Dont try to cover 32 counties in a week. You’ll see a lot, but miss the essence of Ireland. As for cities, I’m biased, but Derry and Belfast are far more vibrant, and offer far better value for money too! Leslie… hope you had a great trip in Ireland. Keep us posted on what you saw.